There are plenty of times that you just don’t feel like cooking. Ordering in is usually the first solution, but it doesn’t have to be the only one! There aren’t very many healthy options for take out, plus the expense can add up quickly. That’s where companies like Blue Apron come in! 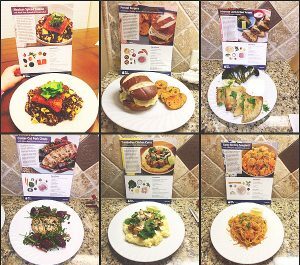 One of my best friends started to use Blue Apron and she sent me photos of each of her meals. I immediately noticed the impressive variety in the type of food. 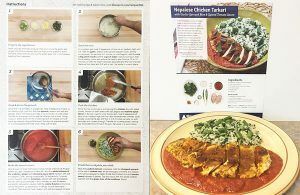 She told me how each recipe could be put together in about 20 minutes and came with step-by-step instructions plus links to online videos to follow along. 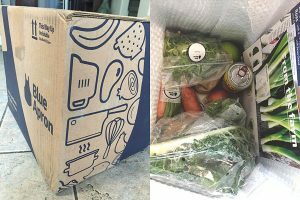 The delivery boxes include everything needed to cook without having to go to the grocery store or come up with a recipe. She sent me a free week so I could try Blue Apron out for myself! I really wanted to get my own feel for the company so I could recommend it to others. My delivery arrived exactly on time from the email notification and came in a refrigerated box. I had ordered the three meals a week for two people package. 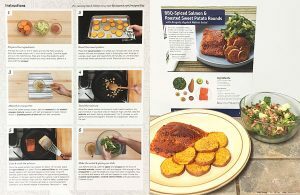 Each meal came with a recipe sheet that showed all the needed ingredients, steps to prep and how to cook with photos along the way (plus the final outcome), as well as a paper bag of extras like spices. The first meal I decided to make was a barbecue salmon with roasted sweet potatoes and arugula salad. The salmon was very fresh and came in a vacuum sealed package. I ended up liking the homemade salad dressing so much that I made sure to remember it to use again for one of my own dishes (which you can check out here)! The second meal was chicken tarkari, which I had never made before so I was really excited to try it! I use ginger spice or juice the root, but I admit that I have never minced it up to use directly when cooking before. The chicken was really moist rather than dry, and I thought the sauce was very flavorful! The last meal that I received was a meatball ragout. My favorite part about this one was the break down of how to put the sauce together. I was also one of those who used to buy meatballs in the past so this recipe demonstrates how to do it for yourself instead. My experience with this company is that it is very well organized, provides excellent quality food and is overall easy to use. The recipes are not complicated but can still be very impressive. Because of this it exposes people to different foods, helps gain experience in cooking and brings awareness to the fact that you can put a great meal together without much effort rather than always resorting to having it made for you. It’s also very user friendly since it offers the ability to view upcoming meals and choose which weeks you want the delivery. I found it extremely simple to set up as well. To be honest I did not know what to expect when I opened that box but the ingredients were extremely fresh and the contents all put together well and labelled so I could figure it all out. The only thing I will point out that I think they could improve on is listing all ingredients in the spice packets they provide. I hoped for this in case I want to repeat any of the meals from scratch in the future. I personally recommend Blue Apron because I had a truly positive experience with it. I cook A LOT and there were still a few ingredients I was not that familiar with using and a recipe I had never attempted before included in my little free trail week. That alone stood out to me, but there are multiple other reasons I would encourage someone to use Blue Apron. The number one reason being portion control. They give you just enough to really teach you to be conscious of how much to put on your plate when you sit down for a meal. This can really, really help people to lose weight properly by instilling a good habit. Another reason is the convenience factor. Sometimes you simply don’t have time to head to the store, or plan ahead by coming up with meals for the week. 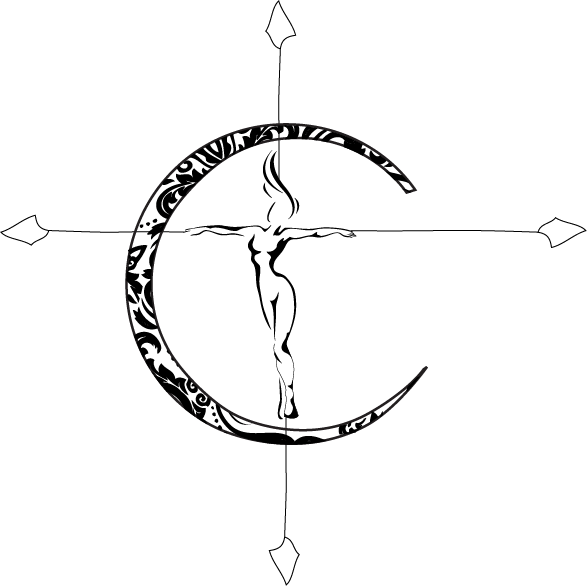 This company does that all for you! Then of course there is the cost- for three meals for two people WITH DELIVERY the price totaled $60 only. Healthy food that isn’t overpriced is always a steal! Plus, think about how many times you order in something terrible for you and spend almost that much on just one meal. Committing to Blue Apron weekly meals does not mean you get that feeling of being ‘stuck’ like most diets either. It does not cover every meal so you still have the ability to eat your own selection for the remainder of the week. 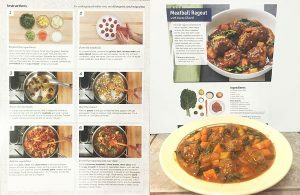 Blue Apron helps people pick up tips on cooking better food for themselves and making smarter choices. So, what will you choose next time you don’t feel like stressing over putting a meal together?? 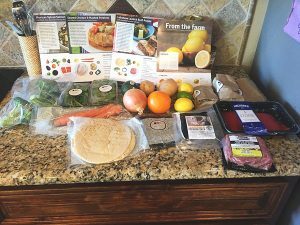 Sign up and check out Blue Apron for yourself! Thanks for the read. Ive heard of Blue Apron, but wasnt sure what they did. What a great idea. Yes, you are still cooking, but it is nice sometimes to have a quick default you can go to, having all the ingredients together and ready to go. Often, I have spent more time trying to come up with something, then realizing I dont have what I need. And pizza is expensive and well, not that healthy. Thank you, I will have to check this out. Exactly! This was a lot faster than I thought and I still felt satisfied for having cooked it myself and having a good meal choice. I’ve heard of Blue Apron before, and wanted to try it but never have. I think I will now! Thanks for the great info! Definitely check it out- you can cancel and reactivate easily, or skip weeks too so it’s not something you get trapped in.